The key to a successful face reconstruction – be it performed manually or computer-assisted – is the anatomical and anthropological knowledge of the human facial soft tissue thickness distribution. Research in the field of soft tissue depth measurement has been very active over the last three decades. In order to approximate the shape of the face of a deceased person, it is mandatory to understand the correlation between bone and overlying skin. Obviously, the forensic sculptor never knows the exact relationship between any point of the skull find and the soft tissue thickness as the cranial bone does not carry this information directly. 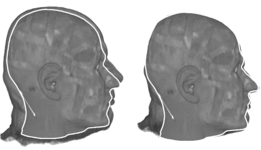 Nevertheless, it is actually possible to create post-mortem facial estimations, because the bone matrix is considered to support the soft tissue. Consequently, it is possible to achieve average soft tissue depth at standardized points on the cranium such as for instance the supraglabella, the nasion, the subspinale, the supramentale or the supraprogonion. A multi-modality framework for forensic soft-facial reconstruction based on computed tomography (CT) and magnetic resonance imaging (MRI) has been developed. 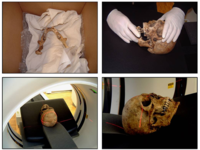 CT is used to acquire a virtual representation of a skull find. The respective MRI templates provide the desired soft tissue information to produce a facial likeness of a deceased individual. Two main complementary strategies have been developed. The first is based on a regularized non-linear warping technique using radial basis functions known as thin-plate splines in 3D space. The second is an automatic segmentation scheme based on active contours, which will provide a facial template that can be morphed onto the CT of the skull find. These approaches are integrated into a framework of a forensic workplace. Buzug, T. M.: Editorial to the Special Issue on Computer-Assisted Craniofacial Reconstruction and Modeling, Journal of Computing and Information Technology, 14(1), 1-6, 2006.